A new TV spot for Star Wars: The Last Jedi aired during last night's final game of the World Series called "Awake" and the hype train is still rolling. 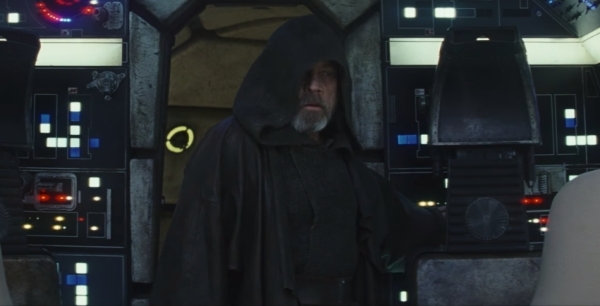 It features Luke Skywalker (Mark Hamill) in his cloak and hood walking onto the cockpit of the Millennium Falcon for, what looks like, the first time. This may be the first time he's been in the ship since Return of the Jedi and we can only imagine the memories he has of his old friend Han Solo (Harrison Ford). You can see the emotion in his face. Most of the other shots are familiar like Chewbacca's adorable Porg screaming. Finn (John Boyega) facing off against Captain Phasma (Gwendoline Christie). Kylo Ren (Adam Driver) punching a wall. There's a new shot of Carrie Fisher as General Organa and I get misty every time. I don't know how I'm going to get through the scenes with her. Supreme Leader Snoke's (Andy Serkis) massive red throne room with his Praetorian Guards. The Falcon blasts through the crystal caverns of planet Crait. AT-M6 walkers lumber on while fighters blast around the sandy dunes. The final shot of the trailer shows a voice over of Luke saying "This is not going to end the way you think!" Then it cuts to Rey (Daisy Ridley) drawing her lightsaber. A lot of fans think Disney is messing with us using editing of the film and this feels like another example. It's hard to believe she'd chop him up, but who knows. A lightsaber battle between Luke and Rey would be epic tho. The saga continues when Star Wars: The Last Jedi (2017) premieres December 15. Check back for more Star Wars: The Last Jedi movie news, trailers, posters and hype! What do you think of the promo? Are you looking forward to The Last Jedi? You know I don't think Luke was in the Falcon in Return of the Jedi. He went to and from Tatooine in his X-Wing and then they went to Endor on the stolen shuttle. He stole another shuttle from the Death Star to get back to the planet. So I think technically the last time he was shown on the Falcon was the end of Empire. But maybe I'm wrong.